The Persephone Readathon has a few days left to go but today’s prompt was one I couldn’t pass up – endpapers! You know, those beautiful papers that you first see when opening a book. I think a lot of new books just have a plain piece of paper but I love it when I see a beautiful design or a map. I love maps. Persephone Books are known for their gray covers but when you open your books the endpapers are stunning. They can be designed after wall papers or fabrics and linens of the era the book is set in. For Day 9 of the Persephone Readathon the idea was to either show some of your favorite endpapers or design some. I have about 12 Persephone books and these three have my favorite endpapers. I love the bright blue and yellow of Mariana by Monica Dickens. The butterflies on Cheerful Weather for the Wedding by Julia Strachey make me smile. Finally The sweet florals of The Far Cry by Emma Smith make me think of soft bed linens. Do you notice endpapers? Any favorites you can think of? If you want to read more about the history of endpapers check out this article. You know what I would love? 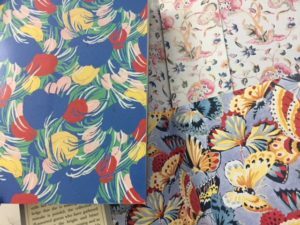 To get my hands on some of those endpapers from Persephone Books. I wish they would sell them and then I could turn those into journals or use them in some of my other artsy projects. Anyway, I hope you all have a wonderful weekend. I’m going to try and finish a book or two and it’s been a while since we went the bookstore so I think a visit is a must. Those endpapers are so pretty. You are right; it seems that most endpapers now are plain neutral papers. I don’t think I have a lot of books with anything else, except for an occasional map. I don’t think I knew that the Persephone books had those lovely endpapers. Honestly, I’ve never had one of the books, so…I didn’t know. I do like nice endpapers and agree, maps are the best. Though sometimes, especially with a library book, a map can be covered up by a dustcover that is secured by glue or tape. There’s a reason why libraries have to do that, but still. These end papers are gorgeous! Since Kay mentioned end papers with maps, my favorites are Deborah Crombie’s end papers with maps of the settings in her books. I also love marbled end papers–so beautiful! I think I notice endpapers most in the picture books I read with my daughter. Some of them are quite creative! I’ve never really noticed endpapers before, so pretty! They used to sell bookmarks that were copies of the endpapers. I guess it’s sold only in person. I haven’t a Persephone book in awhile. The catalog looks interesting! Aren’t Persephone books just lovely. You can tell the care they take in the choice and design of the books. I have a nice healthy stack of them but I haven’t bought a new one in a while. I need to treat myself–and read more of them! I knew you mentioned the readalong before but then life got busy, so sadly I missed out on it. But I still hope to read more of them this year. So pretty!! I would love to have some of those prints for wrapping paper.